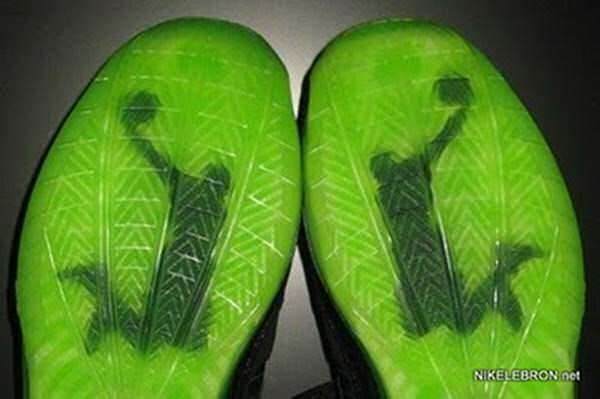 Nike Air Max LeBron VII Dunkman: King's Kryptonite? 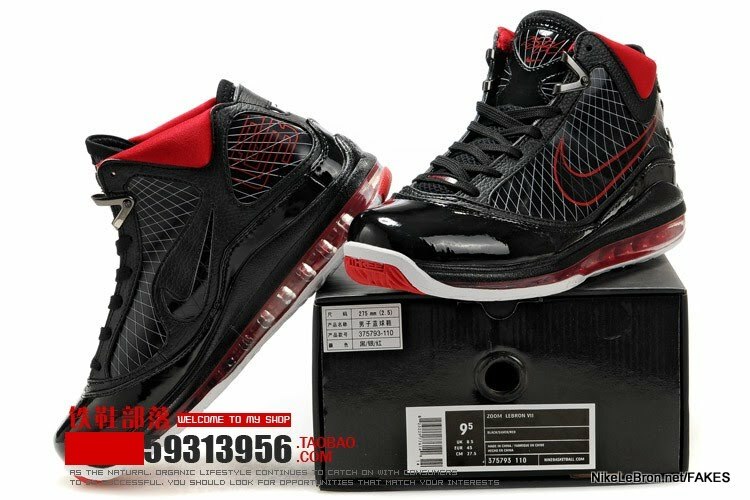 LeBron James' and his Nike Air Max LeBron VII is the Hugh Hefner of shoe colour-ways. Both are constantly upgrading to the latest, the greatest, the prettiest, newest, the rarest, so much so that even the most skilled statisticians and sneakerheads can't keep up! But they always come back to an old favourite. For Hugh, it's the blondes. And for LeBron's signature sneakers, it's the Dunkman. Nike just dropped the gazillionith version of the Nike Air Max LeBron VII, the Dunkman edition. It stays true to the Dunkman template in terms of using grey and "mean" green somewhere on the shoe along with the classic IN YA FACE dunkman logo. The newest edition to the LeBron VII family adopts a glaring neon green sole and keeps the rest of the shoe mostly black with highlights of grey and neon green. It features some nice touches like patent leather trim, nubuck and standard flywire as well as 3M woven laces. The mesh of technological advances on the shoe seems to do best when toned in one colour palette and gives the sole greatest impact. Now, I know LeBron has been using the Dunkman silhouette since the II's and that "mean green" is the trademark for the series. But doesn't the colouring and overall high-tech feel a little like a pair of kicks we saw in the All-Star game a little while back? 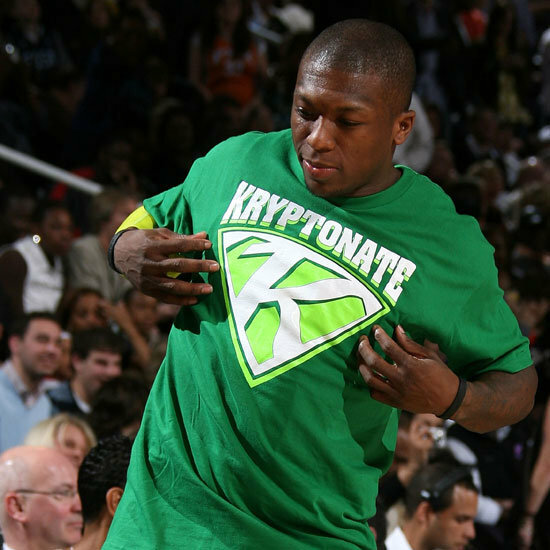 Of course I'm talking about the Nike Foamposite Lite KryptoNate, the kicks the little man, Nate Robinson, used to tame the beast that is Dwight Howard. Robinson (Nike) soared over Howard (Adidas) with bright neon green soles highlighting the Sprite (shades of green, especially neon) Slam Dunk Content, so why not stick a winning formula for LeBron? After all, as the King sat courtside last All-Star game, he stated that he wanted to compete in 2010. The LeBron Dunkman VII's have already dropped in a pre-release at MarqueeSole but won't go wide until March. The NBA All-Star weekend takes place in Dallas, Texas under the watchful eye of Jerry Jones from February 11th-14th. That leaves plenty of time for the average baller and obsessed fan (kids with parent's credit cards) to see their idol murder the competition and be crowned the Sprite Slam Dunk Champ....if LBJ does compete. I'm sure he'll have another colourway just for the All-Star game, but isn't the dunk contest be a great marketing tool? The photos and videos of Kryptonate and Superman went viral and are still all over blogs. The All-Star game is all the about the gimmick now and Nike (and King James) knows a good one when they see it. After all, doesn't everyone, little kids and big kids, want to be a superhero? Would you cop the kicks? What's your favourite Nike Air Max LeBron VII? Personally, I'm feeling these and I was very disappointed when I found out that the I Love New York joints are fake. But I'd take the candy apple red ones he wore at MSG no sweat. 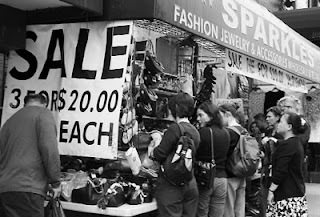 There's always Canal Street.....but I could never mess with counterfeits! PS. Shoutouts & smooches to: Freshness mag, Nice Kicks, Kicks on Fire.